There’s nothing more enjoyable then a solid burger and an excellent glass of whiskey. Luckily, at Lloyd Whiskey Bar, you can get both! There’s an extensive list of whiskeys broken down by variety from bourbon to scotch and everything in between. Not sure what you might like? Don’t be afraid to ask the bartenders! They’re extremely knowledgeable about each bottle behind the bar, from flavor profile to proof, and are more than willing to give you suggestions based on what your usual brown liquid of choice is. 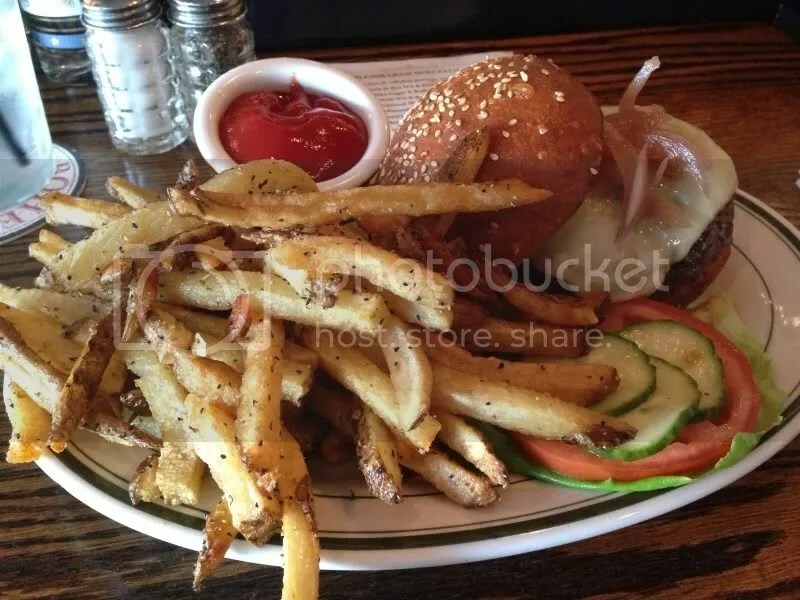 As for the burger, its patty is a home blend topped with cheese, caramelized onions, lettuce, tomato, and bread & butter pickles under a seeded brioche bun. The burger came out perfectly pink in the middle and was nice and juicy. The bun was soft, reminding me slightly of the buns at The Industry: shiny and seeded on top, soft and thick on the bottom to absorb all the moisture. I did unfortunately find myself running out of bottom bun when I got down to the last few bites. Lettuce and tomato were nice and crisp, and the bread and butter pickles gave the burger a little touch of sweet and sour. The menu says that it was topped with muenster cheese, but it looked like possibly American or white cheddar; it definitely didn’t taste like muenster. Either way, it was a decent burger and pairing it with a glass of Bastille, a French whisky, made it a great combination. Posted in buns, burger, burgers, Fishtown, Lloyd, onions, philly, seeds, whiskey. Bookmark the permalink. WOW- Wish i was there!!! Looks delicious!